That have feathers and fur and claws galore! PLEASE BE AWARE: There is a 1km dirt road to our venue. It is suitable for most normal cars but not for vehicles with very low suspension. From 10am – 6pm the Fayre opens to all manner of fantasy games and craftsmen. Dress up! Fantastic prizes in the Adult and Kids fancydress categories … get 15% discount from Sinderella Costume Hire in Randburg when you hire a costume for this event! Know your fantasy stuff? Grab a team and join our FANTASY QUIZ! We are so proud to be supporting HuskyRomi Wolf Sanctuary at this event – expect to learn about their gorgeous wolves! 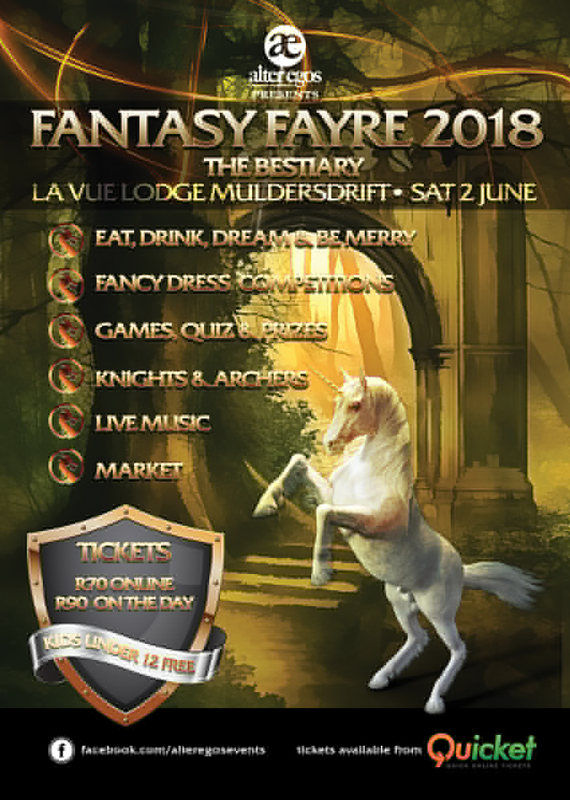 Expect all manner of fantasy themed market stalls and merriment: play a Game of Kubb (Viking Chess), have a go at archery or sample Eoin’s Tankard mead while you watch weapons forging; or try your hand at the Axe Toss! Wander through the market to the sounds of the bards and the clash of steel on steel as the JuggerKnights spar. Hand made jewellery, dragons, ceramics, art, clothing, craft beer and delicious food and more is on sale at the stalls.